At $399 per desktop initially, and only $49 recurring annualy, Takeoff Live is the affordable yet elegantly simple digital takeoff software solution. 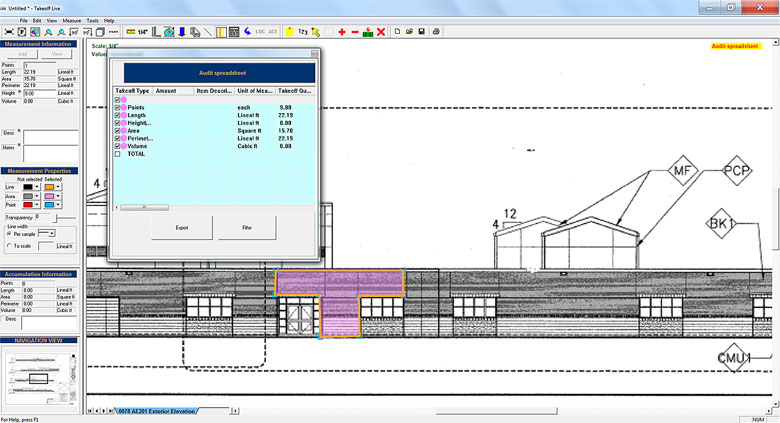 You can use virtually any digital file for your quantity surveys and calculate lengths, areas, counts, and volumes. Export to Excel with just a click or use the internal spreadsheet to put prices in for labor, material, subcontactors, equipment, and other costs. Try our fully-functional trial for 15 days free. Pros: Being one of the original purchasers of E Job Cost I saw the growth of this product from the beginning. It has always been reliable and useful in doing take offs from plan sets. As it has evolved to Takeoff Live a lot of additional features and improvements have been added making it much more robust and even easier to use. 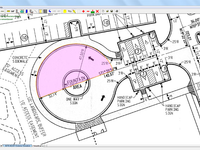 The fact that I can set my scale using a know measurement or to an architectural or engineering scale allows me to work from cad drawings, hand drawings and photographs. Cons: There really aren't any cons. There are different levels of the product which allow you to customize it to your needs and everything works as advertised. Overall: I highly recommend this product to all of the contractors I work with. Pros: Does any size or type of job takeoff. If you don't have or can't find the scale, you can set it yourself from a door opening or a dimention. you can do takeoffs from a photo if you want. Does all scales, all plans,etc. Can get plans VIA email or however and do a takeoff. Exports to excel or just print the form in Takeoff Live directly. Support is the best and most responsive support you will ever get anywhere! I recommend this for anyone who needs quantities for estimating, ordering or whatever. You can get a satalite photo of a roof or a photo of a building, or anything, set your own scale, and do a takeoff. Overall: Highly recommended! i wish all products were this good a value. Pros: I am a long time user of Takeoff Live, its been a great product. Its clear, concise and easy to use and that is very important for me as I am a migraine sufferer and computers are one of my triggers. Im not in the business any longer but from time to time I get request to do small jobs and Takeoff live is what I use and suggest to others that may be looking for a great takeoff software. Cons: None that I can tell, its difficult sometime to get tech support. They are great when you get them its just sometimes takes time to get them. Overall: I would and have recommended this to those I know having a difficult time doing takeoffs from traditiona paper plans to digital formats. Its easy and the learning curve is small. Cons: Save function - doesn't seem to be able to be modified to a different directory? Overall: Have recommended it to a couple of others that I know already - even one who had bought a more expensive package and found it was too cumbersome for his needs. Pros: Accurate, adequate features, exports to excel, relatively inexpensive. Cons: Does not have hand grab drag tool (except on sidebar), can't undo a finished area or lineal measurement, crashes sometimes. Overall: I got burned once doing manual take offs to the tune of about $20K (I left a page of written measurements out of the final tabulation. I vowed never to let that happen again, and started shopping software programs. I chose Takeoff Live, and I'm glad I did. As long as you save often, and learn the quirks of this software, you can do everything you could have with a much more expensive piece of software, for a fraction of the price. Also, when you need help, their customer service is friendly, helpful, and above all, prompt! Pros: I am truly grateful for the time and effort you all have put into this program. It has decreased the time it takes to estimate a project by more than 400%. I can take off 4 projects with this software vs. my previous takeoff procedure. And thank you to Dee for being so involved and responsive regarding his product. It has truly changed the way I can produce at the office. Overall: I would, and have, recommended this product to all of my contacts in the construction field. It is an abolute assett to my company and productivity. Pros: Very easy installation, easy learning curve, I have a condition that make it hard for me to look at computers long so the speed at which I can complete a project is important to me, The spreadsheet portion of the software is invaluable and saves me a lot of time and litteraly headache doing calculations. Just a supreme software. Cons: customer support is great but sometime slow in getting back to you, the version I have, you have to be online to use it. Can be cost prohibitive to some. Overall: I would recommend this software to anyone who needs a great time saving estimating software. Pros: Take off Live is everything I need to estimate jobs we are tendering. I find it easy to use and accurate. Cons: I haven't found any problems with it to be honest for what I use it for. Overall: I think this product is fantastic for measuring areas as it is accurate & very very affordable. I have not looked back since I found it & the cost is unbeatable! 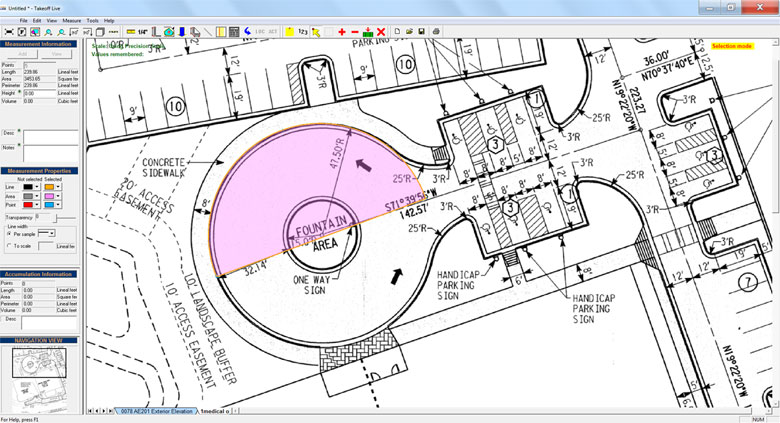 Pros: The ability to use pdf drawings rather than dwg or other media has allowed me the ability to have more accurate information which in turn reduces bid ambiguities. Cons: Depending on your computer security software, it is sometimes necessary to stop security applications from booting and then register Takeoff Live again. Overall: Using Takeoff Live set me apart from the average consultant and my work is of more value to my employer. I have not seen a comparable product with the type of customer support the Takeoff Live staff offers. Give it a try and you'll see what I mean. Cons: could not think of anything wrong with the current version of the program. Overall: I would recommend Takeoff live to anyone in the construction industry. Best bang for the Dollar spent on software to make my business and life a lot easier. Cons: Only works on area as highlighted, could use some pitch calculators to make it more suitable for roofing. Also makes no allowances for 3D measurements as per floor plans. Pros: The most versatile and user friendly On Screen Take-off software I have ever used. Since I started using Take-off Live, I have retired both Quest Take-off and Toolbox2. Complex take-offs, odd shaped areas are done with such ease. Cons: I am sure there is something, but I haven't found it yet. Overall: Without a doubt this is the ONLY on screen take-off software that I would recommend. Pros: I was up and running in minutes. Cons: Wish it was free. Overall: Two thumbs up, great tool for anyone who has to do estimates, bills of materials, and quotes. Pros: Great takeoff tracking of estimated take off quanities. Ideal for both sub takeoffs as well as GC use. Cons: Use is by seat. If the use was by paid subscription so more people could use the same license while not exceeding the number purchased it would save us some money. Overall: Awsome package for the money! Cons: Despite the fact that I only just purchased a version last month, it wont let me access the software, saying that my "trial period has expired" even though I have already paid $600! Pros: We bought this program last year and it has been, without a doubt, one of the best software investments we've ever made. The support is fabulous and product is so easy to use! Comments: Have used the product for the past 6 months to prepare bid for our clients. Once I learned the product I have been pleased with the performance. I would recommend it to other builders for making bids. Pros: Takeoff Live reduces the time I spend doing takeoffs considerably. It's easy to use and bug free. The price is very good. Overall: Excellent and well priced. Comments: Wonderful software tool, especially for the price. I may need more practice using the accumulation tool, but it is a little awkward. Overall, GREAT product! Pros: Handles Multiple drawings within a file. Works on PDF format drawings. Software has comprehensive on line help. Cons: Some of the label fields when entered are not editable. Needs to have more formating options for data to be exported. 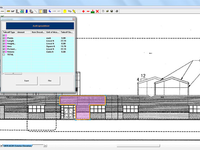 Overall: A reasonable tool for estimators to take quantities off drawings. Pros: Easy to learn & use, accurate & cost effective. Overall: I strongly recommend this product for basic takeoff of on line plans. Cons: Overpriced for a product that is only licensed for 12 months. I would not recommend this product to other people in my industry. Overall: I originally thought that I had purchased this product (I must have missed the small print stating that it only work for 12 months). As this is not the case I would not be able to recommend this product. Overall: Too many screens with outdated appearance. Not very appealing to to look at some of these screens. Not intuitive at all. There are more appealing program out there. The learning curve is steep compared to other programs. Regret buying this program. Cons: we went from Planswift to Takeoff Live because it was cheaper and we don't use the estimating side off planswift. However we find Takeoff live awkward to use and have gone back to planswift. Needs some improvement for me to use. with a spread sheet with items not identified. Cumulative takeoff is very awkward. Overall: Pencil & paper works better for me. Cons: Takes forever to navigate around a page - Should have bought the other program that runs faster.